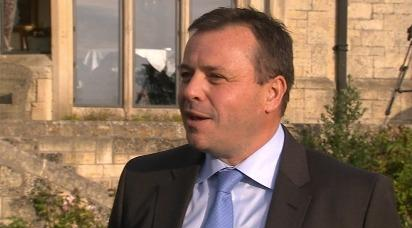 Former Tory donor Arron Banks has upped his opening donation to UKIP from £100,000 to £1,000,000 after being stung by big-hitter William Hague who said he had never heard of him, and that he was “not a big figure”, which may leave other Tory multi-millionaire donors wondering exactly in what esteem they are hold by their party. Banks’ defection had been announced this morning to coincide with David Cameron’s leader speech at the Conservative party conference, the latest in a string of defections that have included members of parliament, local councillors, a former London deputy mayor and donors. Despite that senior Tories insisted they remained “upbeat”. “In the first instance I would like to thank you for your efforts in raising funds for the UKIP cause. It is clear to me that your fundraising ability deserves formal recognition and I would like to offer you the role of Deputy Treasurer on or before your forthcoming retirement from front bench politics. The BBC reports there has been some confusion over the exact extent of the donations made to the Conservative party made by Mr. Banks in the past, insisting the figure was more like £25,000, rather than the £250,000 figure UKIP claimed. In a statement this morning Mr. Banks said “I’ve supported the Conservatives for a number of years but have come to the realisation that only UKIP supports my views. “Being a member of the EU is like having a first class ticket on the Titanic. Economically, remaining in the EU is unsustainable. We are being dragged down to the lowest common denominator of financial growth when we should be looking to trade worldwide and should be basing our future prosperity on a long term global outlook”.